Limited 180g vinyl, only 500 hand-numbered copies. Includes poster and download card. This is the first full-length album by Cuban producer BARRIO, with features on the mic by DISTANTSTARR (Expansions Collective / Divine Atoms), SADIQUE ''NV'' DABALE (Bight of Benin), PL (SoulFamilia) and MAODEA (De la Boucle) on a co-produced track. BARRIO's first appearance was in 2009 under his ROOQ alias, on the Mochilla album ''Beats and the abstract truth'' mixed by RAS G. He produces for the French rap club ''L'ADLD,'' also for the futurist duo ''MY NINA'' on Cosmonostro Records. His last appearance was few months ago on the compilation ''La Boulangerie vol.3'' (Nowadays Records). 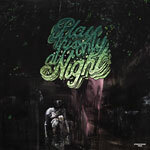 On ''PLAY THIS ONLY AT NIGHT'' BARRIO explores the psychedelic form of beatmaking by using raw progressive rock samples coming straight from the 70's era and dirty African loops. Be sure to experience a true mystic, mind-altering trip listening to this crazy project! Expect raw and heavy beats! Recommended for fans of Oh No, Kankick, Gaslamp Killer, MF Doom.